3 Bdr / 2 Bath / 1387 sqft. 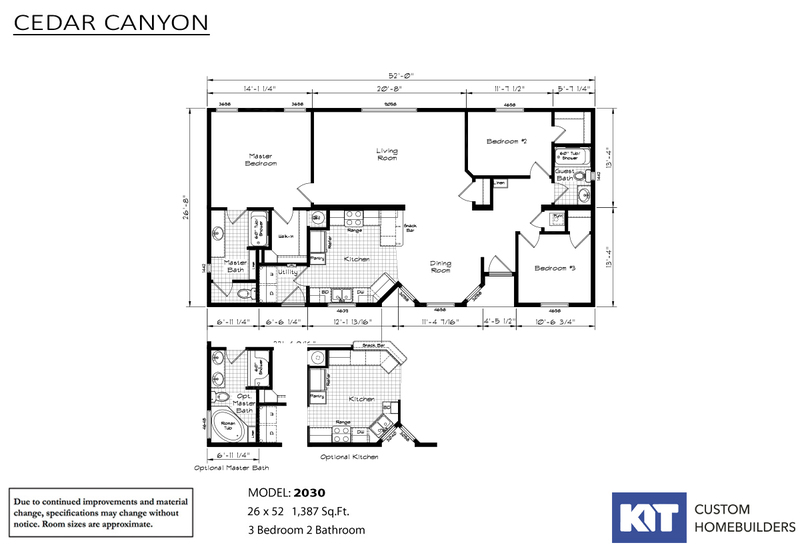 - This Cedar Canyon 2030 is another example of the fine craftsmanship of KIT Custom Homebuilders. See your local KIT retailer for more information. All Cedar Canyon homes are available is the LS series. 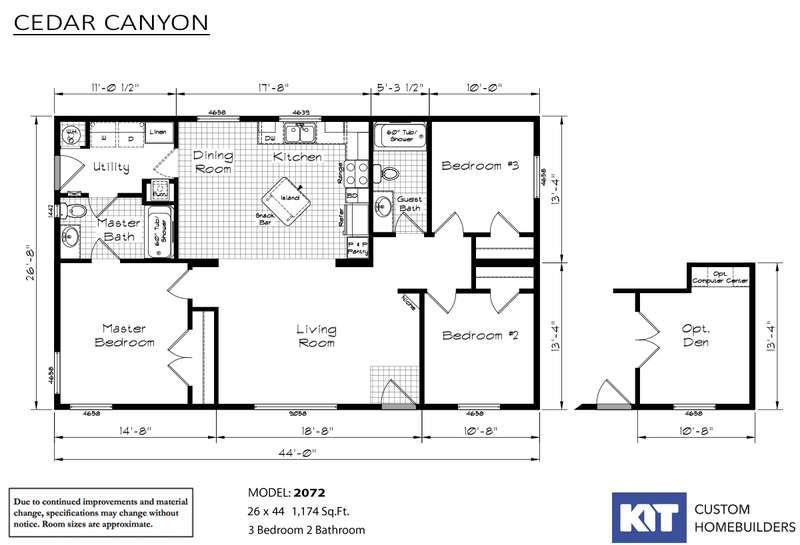 3 Bdr / 2 Bath / 2085 sqft. - Home has a standard porch and a great formal foyer that opens into the dining room and living room. Dining room has full view of windows that wrap around the room. Kitchen has fantastic storage, a snack bar and and island with a snack overhang. 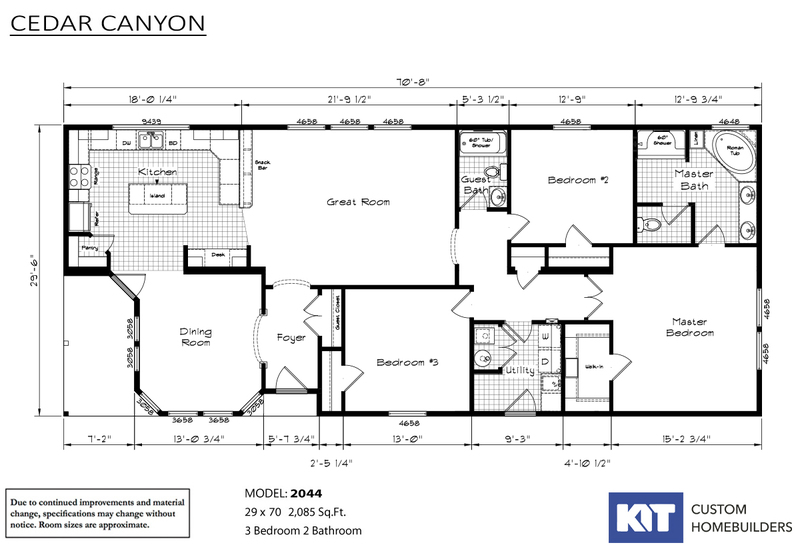 This Cedar Canyon 2044 is another example of the fine craftsmanship of KIT Custom Homebuilders. See your local KIT retailer for more information. All Cedar Canyon homes are available is the LS series. 2 Bdr / 2 Bath / 1173 sqft. 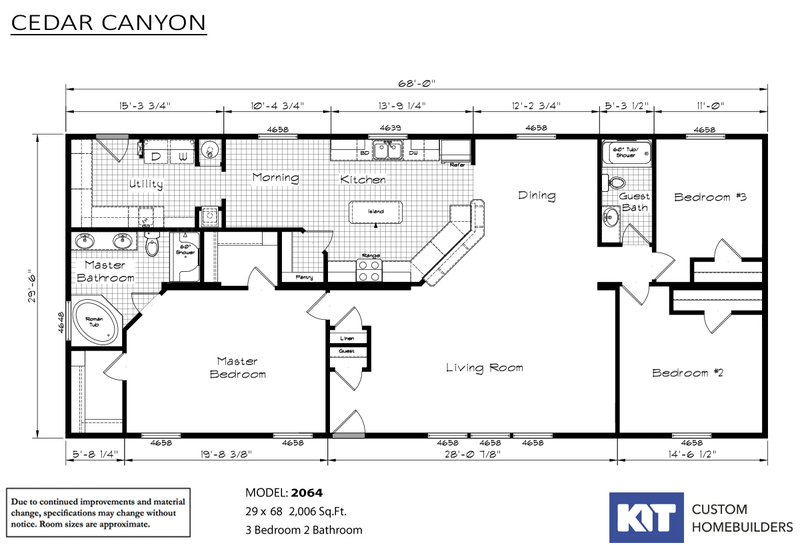 - This Cedar Canyon 2048 is another example of the fine craftsmanship of KIT Custom Homebuilders. See your local KIT retailer for more information. All Cedar Canyon homes are available is the LS series. 2 Bdr / 1 Bath / 960 sqft. 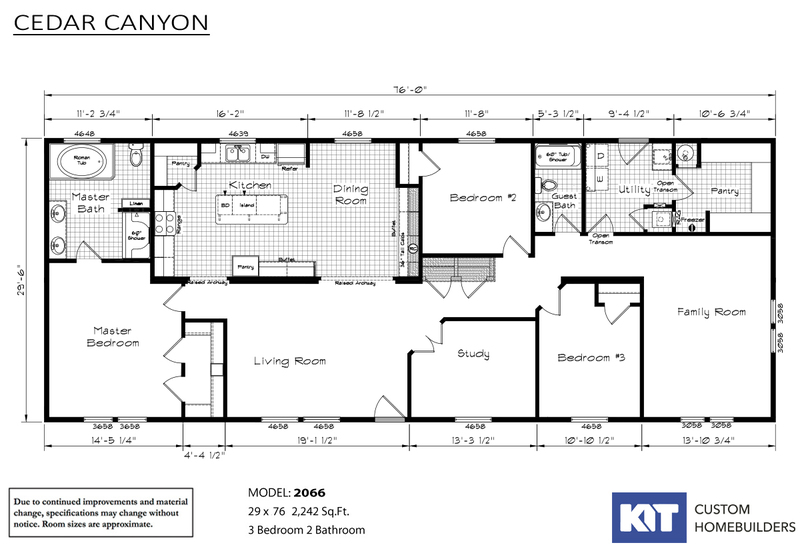 - This Cedar Canyon 2055 is another example of the fine craftsmanship of KIT Custom Homebuilders. See your local KIT retailer for more information. All Cedar Canyon homes are available is the LS series. 3 Bdr / 2 Bath / 1920 sqft. - Huge living room and dining room combination. Covered porch which opens up into a full foyer area. Double walk in closets in master bedroom. 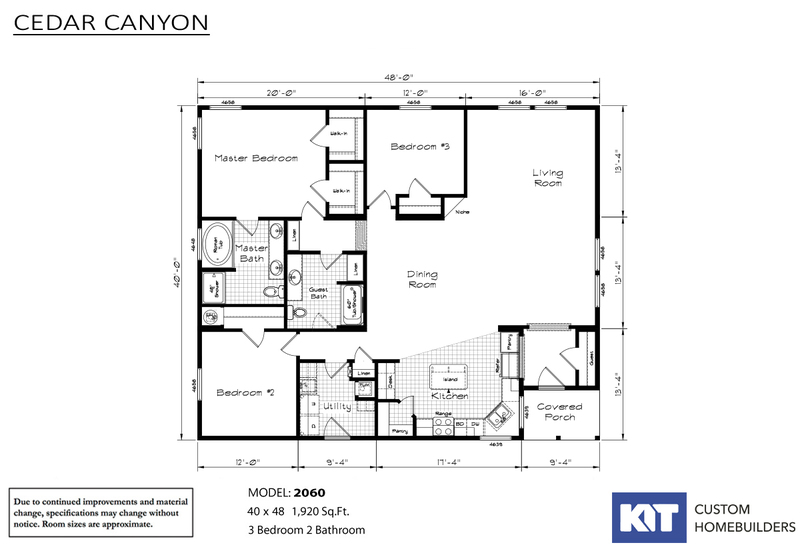 This Cedar Canyon 2060 is another example of the fine craftsmanship of KIT Custom Homebuilders. See your local KIT retailer for more information. All Cedar Canyon homes are available is the LS series. 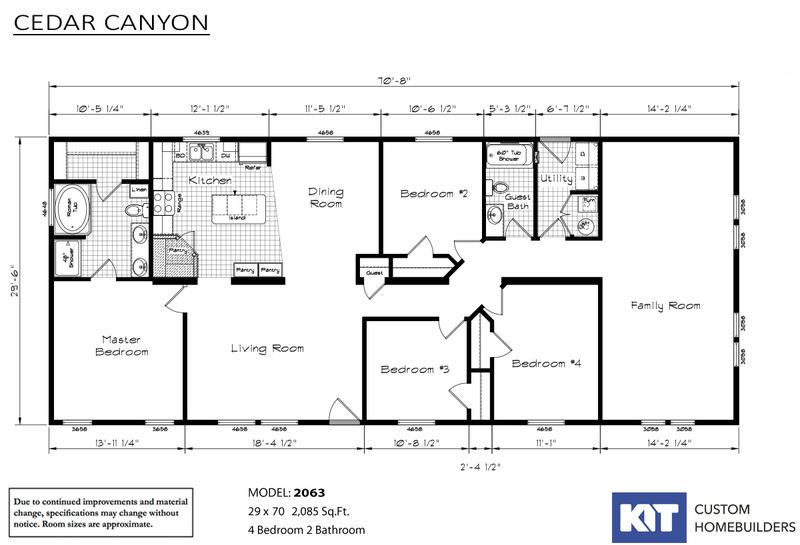 3 Bdr / 2 Bath / 2242 sqft. - Sprawling home boasts an expansive living room, beautiful gourmet style kitchen with center island and extra large chef’s pantry, spacious well located family room and master bedroom with luxury bath featuring roman tub, walk-in shower, dual sinks and two walk-in closets. 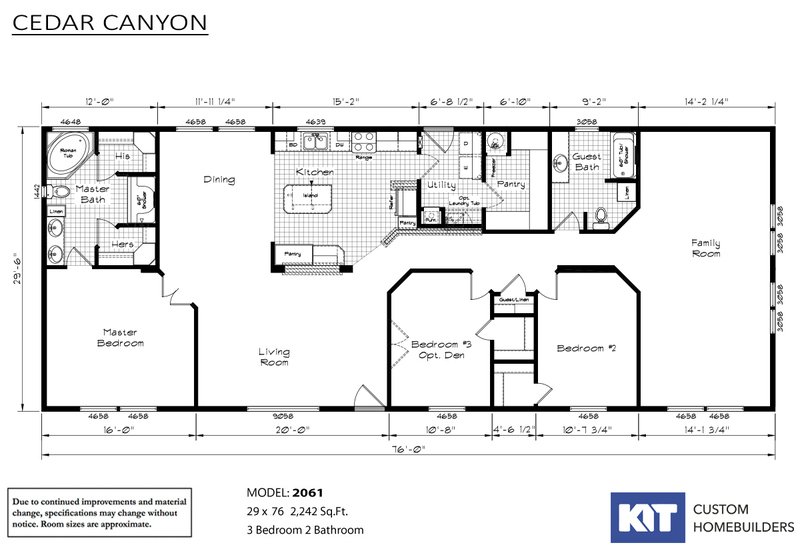 4 Bdr / 2 Bath / 2085 sqft. - Spacious rambling home features spacious living room, bright modern kitchen with center island and walk-in pantry, extra large family room, privately located comforting master bedroom with elegant bath en suite that boasts large roman style tub, 48” walk-in shower, “his” and “hers” sinks and walk-in closet. 3 Bdr / 2 Bath / 2006 sqft. - Elegant value oriented home features extra large living room, beautiful gourmet style kitchen with center island, lots of handcrafted wood grain cabinets, seemingly endless countertop space, walk-in pantry, and a bright morning room ideal for casual dining and relaxation. 3 Bdr / 2 Bath / 2242 sqft. - Expansive customizable home with spacious living room with adjoining double door entry, large modern fully equipped kitchen with center island, and utility/laundry room with large walk-in pantry that supplements an abundance of storage capacity throughout this well conceived home. 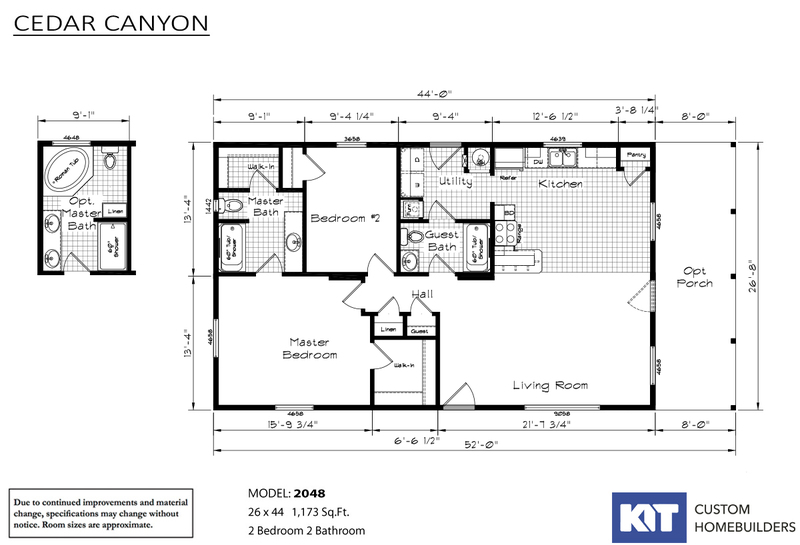 4 Bdr / 3 Bath / 2065 sqft. 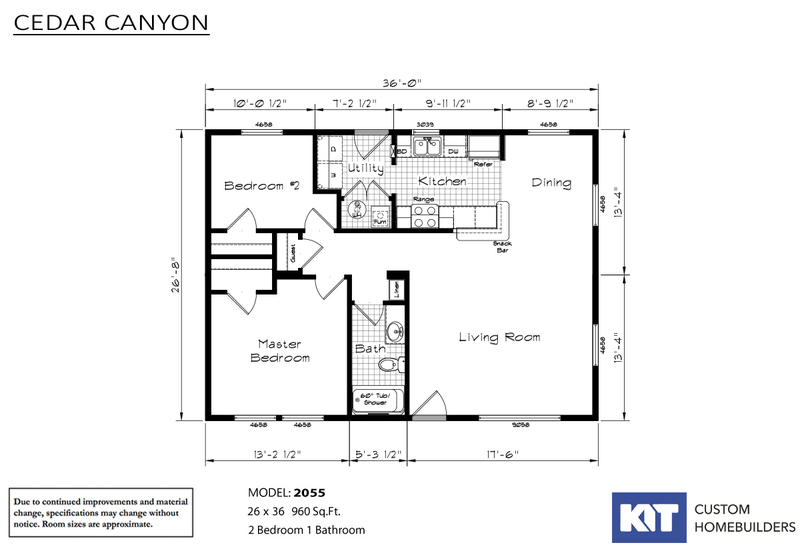 - Several customizable options in this popular dual master suites floor plan layout with available den option in lieu of bedroom #2 and/or a extra large family room instead of second master bedroom suite. Three baths are ideally located to accommodate the change options selected. 3 Bdr / 2 Bath / 1174 sqft. - Skillfully conceived affordable family home with spacious living room, beautiful modern kitchen with convenient center island, king size bedrooms and elegant baths. Den option available in lieu of third bedroom. 2 Bdr / 1 Bath / 747 sqft. - Nice two bedroom home with snack bar between kitchen & living room. 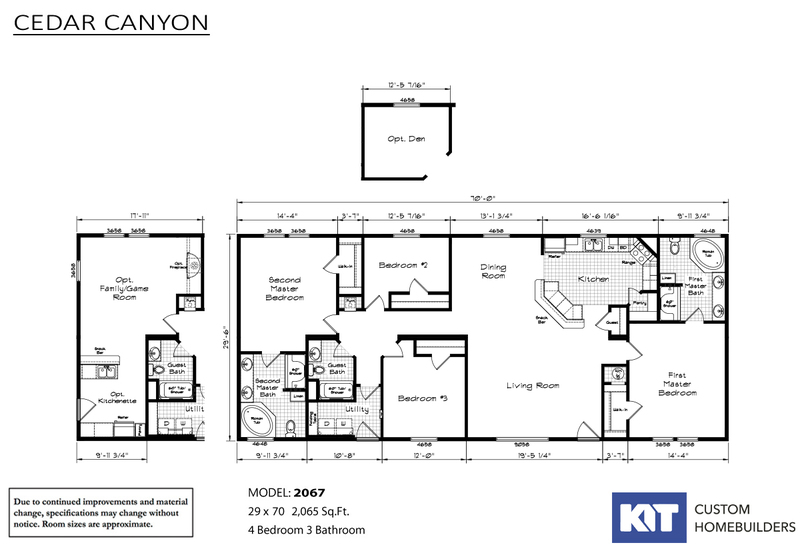 This Cedar Canyon 2023 is another example of the fine craftsmanship of KIT Custom Homebuilders. See your local KIT retailer for more information. All Cedar Canyon homes are available is the LS series.